While at the Oregon Museum of Science & Industry’s (OMSI) alternative-fuel vehicle showcase, Drive Revolution, I had the chance to drive each vehicle for about 10-15 minutes. You can learn a lot in a short amount of time regarding a car’s personality, handling dynamics, its pros and cons, and if you would consider buying one. 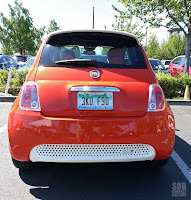 The Fiat 500e I drove was painted Arancio Elettrico (Electric Orange). It’s dynamic, distinct, and delightful. The color is fully saturated—it begs for passers-by to approach it for a closer look. The exterior is accented with white-painted side mirrors, a lower front grille, and rear spoiler. This mighty mini also comes with chrome door pulls, side marker turn signals, 15” aluminum wheels, and projector headlamps. Inside, the funky and fresh interior just seems to speak to you, and there’s an array of visual goodness. 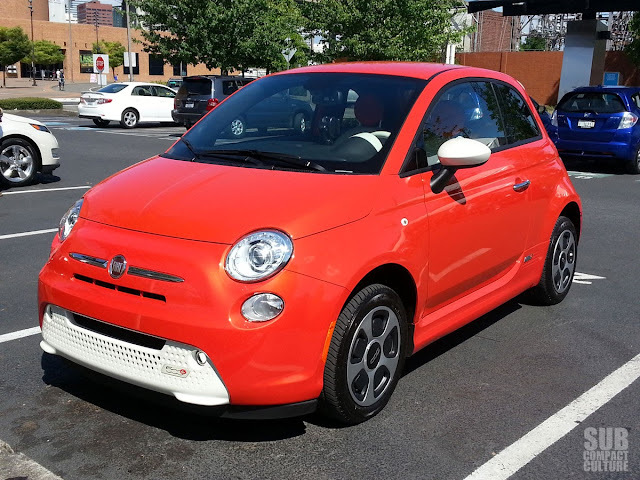 The leatherette upholstery’s Steam White accenting and front dash and door material accents are starkly contrasted with bright orange dots for head rests and door accents. Of course, the cargo areas are black/charcoal. Dark finishes, such as those in the cargo area, are good for hiding dirt, but one has to wonder what a pair of dirty hands would do to all the white interior bits? 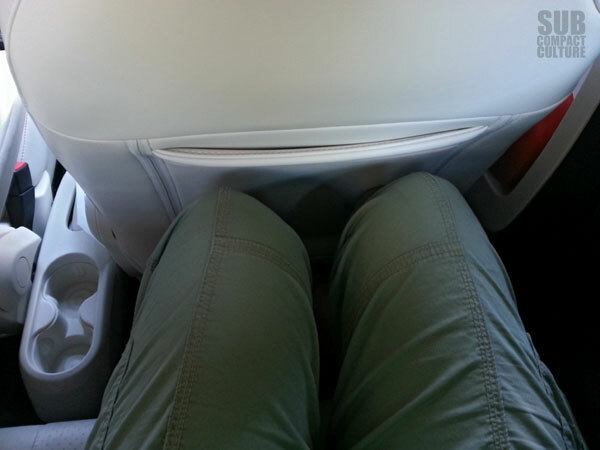 The front seats are supportive up front, but a bit tight in back (although me being 5’-4” tall, I did have an inch or so of room for my knees). The dash is nicely designed. Everything has its place, and the functionality is well thought-out. The premium gauge cluster with 7” TFT display is very nice. Digital, colorful, but most importantly, easy to understand and read. I feel this cluster is a much better design than the 2012 Fiat we reviewed about a year ago. Another cool feature is the push button automatic shifter. A great feature, as you never have to worry about getting to any of your other dials, buttons, or cubbies behind a traditional automatic shift stalk. One thing to note that I did not like, however, was the factory hard-wired placement of the TomTom navigation system on top of the dash. It seemed obtrusive for a short person like me. I found myself trying to look all around it or wanting to take it off while driving, versus wanting to look at it. 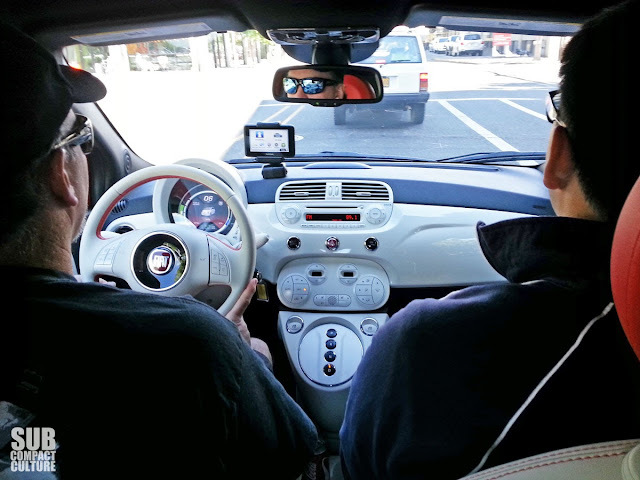 Adjust the mirrors, seat, start the 83 Kw electric motor (which makes 111hp, and 147 ft/lbs of torque), and let’s drive. 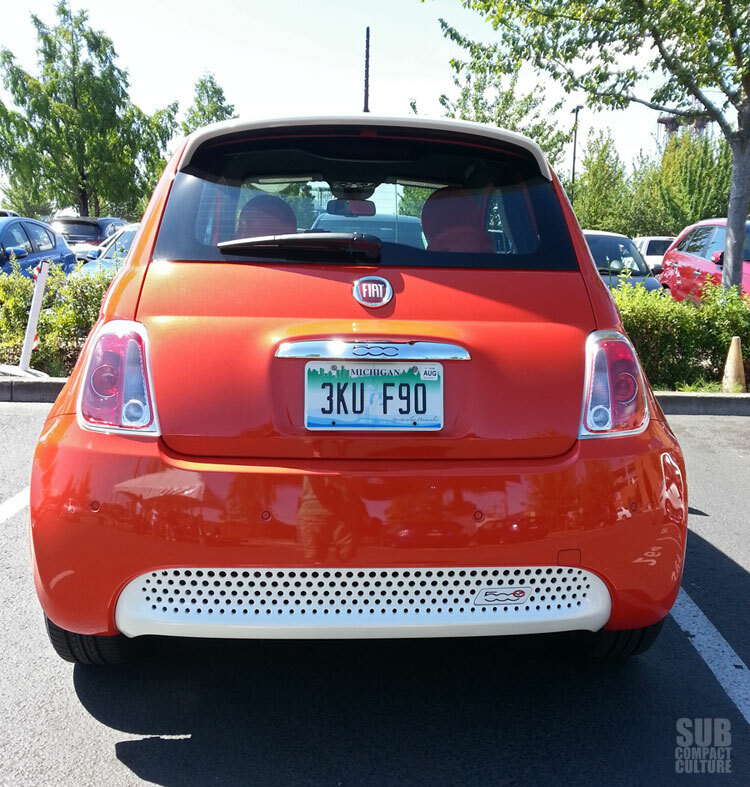 The Fiat 500e takes off easily, but it won’t win you any drag races. It corners well (or as well as anyone with a total of 10 minutes’ drive time could tell you), and it handles bumps and bruised roads wonderfully. It was fun to drive, and certainly got the looks too. Why wouldn’t you take a look at a bright orange, fierce, feisty fun car coming your way? This car gets 116 MPGe, close to the class-leading 121 MPGe for the minicompact car segment. Its range is fairly impressive at 87 miles on a full charge. That would save you an estimated $9,100 in fuel costs over 5 years. Pretty cool, I say. Once I got back into the staging area where all the other cars were, it was time to say goodbye. Goodbye, I said? No, I wish I could have stuck it in my back pocket and made off with this bad-boy bitti. But alas, I gave it up to the next journalist. It was fun while it lasted! 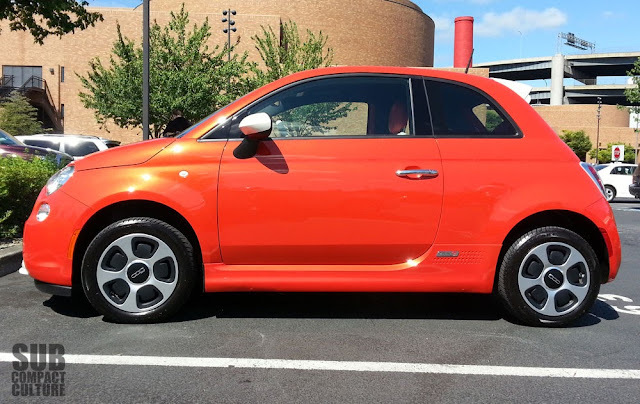 So, you may be asking how much this dynamite little car would run you? Total price for this particular model ran $33,495. It does, however, qualify for up to $7,500 worth of federal tax credit, as well as potentially state and other incentives too. That brings the price down to a more attractive $25,000 approximation. The Fiat 500e is an front-runner in the EV A-segment class. Especially for an all-electric vehicle, I say that is an A+.